Westerly portal of Dover, NH arch on the B&M. Northerly portal of Greenfield, MA arch on the B&M. 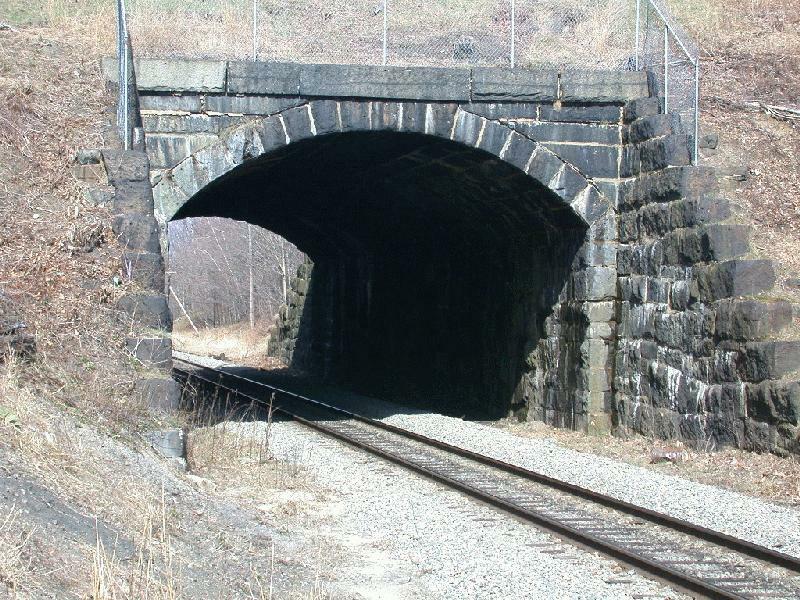 When New England's earliest railroads were built starting in the late 1830s, the best available technology for bridges with spans of up to 50 or 60 feet was the stone arch. Good granite was plentiful, and where the investment was warranted, a stone arch could be expected to support heavy loads with little maintenance. Well-financed lines used stone wherever practical, and even a route built on a shoestring might use stone in a few locations, to project an image of prosperity. This practice continued until iron and steel bridge technology matured in the 1870s and 1880s. 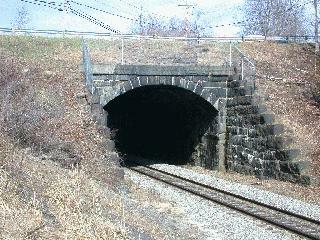 Quite a few of these stone arch bridges survive, ranging from the various sizes of granite culverts found on many active and abandoned lines, to big arch bridges and viaducts like the Concord River bridge at Lowell, MA and the Canton Viaduct on Amtrak's electrified Northeast Corridor main line between Boston and Providence. 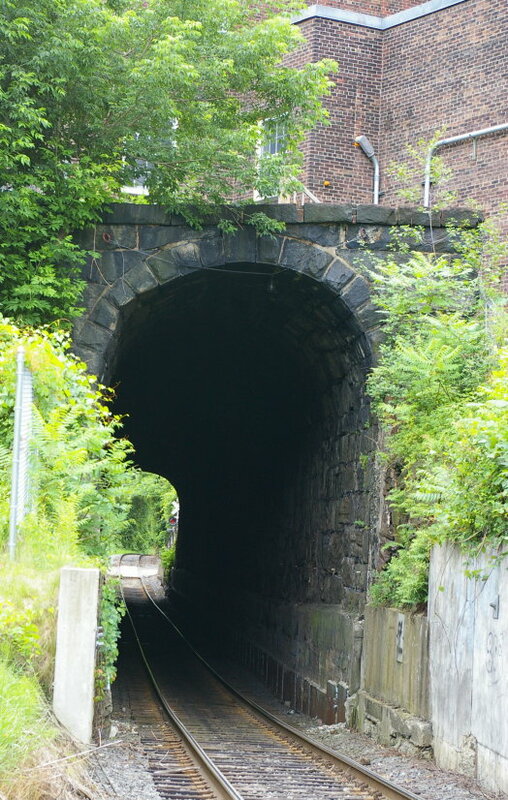 Some, like the Western Railroad's dry stone arches over the upper Westfield River between Springfield and Pittsfield, MA, have attracted the interest of historians and preservationists. One major difference between early New England railroads and those built later, or elsewhere in the country, was that the alignment often passed near or through the center of an established town. 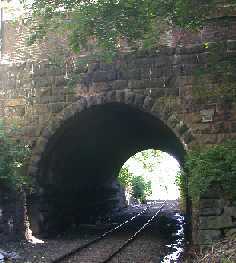 If the desired railroad grade required cutting below street level, the streets were sometimes carried over the tracks on "cut and cover" stone arch tunnels. Where only one street needed to pass over, the arch would be less than 100' long, depending on the width of the road and the difference in elevation. Where real estate values were high, an early appreciation of "air rights" led to tunnels several hundred feet long, often topped by buildings. Bellows Falls, VT Vermont Valley 275 ft., single track, under commercial buildings 1851 Drastically deepened in recent years, in use by New England Central, Amtrak Vermonter, Pan Am Ry. As a New England modeler, I find the arches interesting in several ways. They remind the audience of the earliest era of American railroading, and help provide an appropriate scenic context for my models. They can be used to separate scenes in contexts where a more conventional tunnel would be out of character. And in cases like Salem and Newburyport, where a single track arch (using gantlet track in Newburyport's case) separated the passenger station from the engine terminal and coach yard, they provide an interesting operating focus. Although the arches were built with what were probably felt to be generous dimensions at the time, they presented problems when engines and cars got larger in later years. 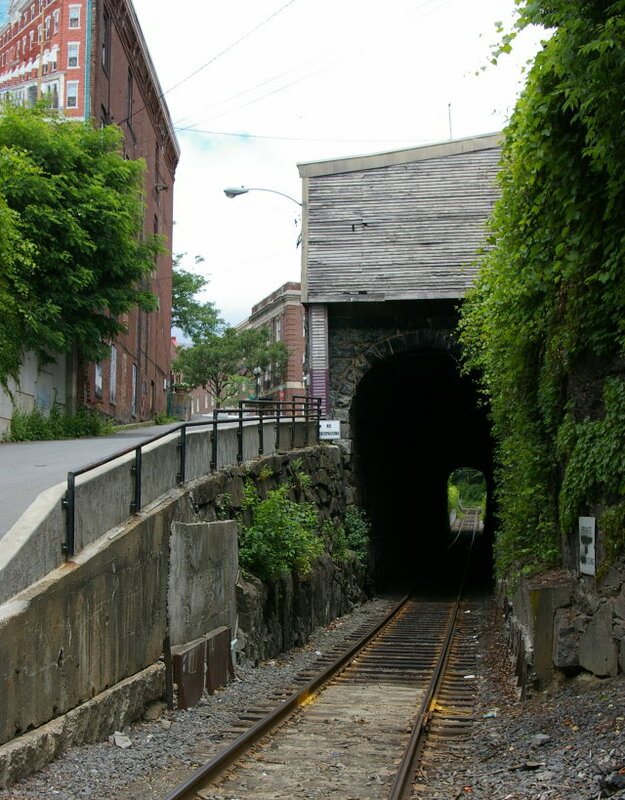 The Salem Tunnel was too tight for most of the steam locomotives the B&M purchased after 1920, which cemented the dominance of the original B&M route through Exeter, NH as the through freight route to Maine. New steel boxcars built with a 10' 6" inside height (after the PRR forced their X-31 class on the rest of the North American railroads in 1931) were also too large - from the 1930s until 1958, the High Car job ran daily from Boston to the Northey Point yard via Wakefield Junction and Peabody. When the B&M wanted to start Trailer On Flat Car service in the mid-1950s, the arches at Greenfield and Dover were too small. This was solved by reducing their double track to single, and installing CTC. They've all been through several cycles of being dug out deeper since then, but even so none allow double-stacks. The arch at Bellows Falls remained an obstacle into the 1970s. The buildings above it prevented it's being daylighted. The bridge over the power canal north of the tunnel had too little clearance above the water to be lowered. This bottleneck kept first the Cheshire Branch through Keene and then the old Northern Railroad route from White River Jct. to Concord and Boston active as alternate routes for over-dimension cars. It wasn't until Vinay Mudholkar, later Chief Engineer of the B&M, figured out how to reduce the depth of the bridge decking that the arch could accomodate TOFC traffic. 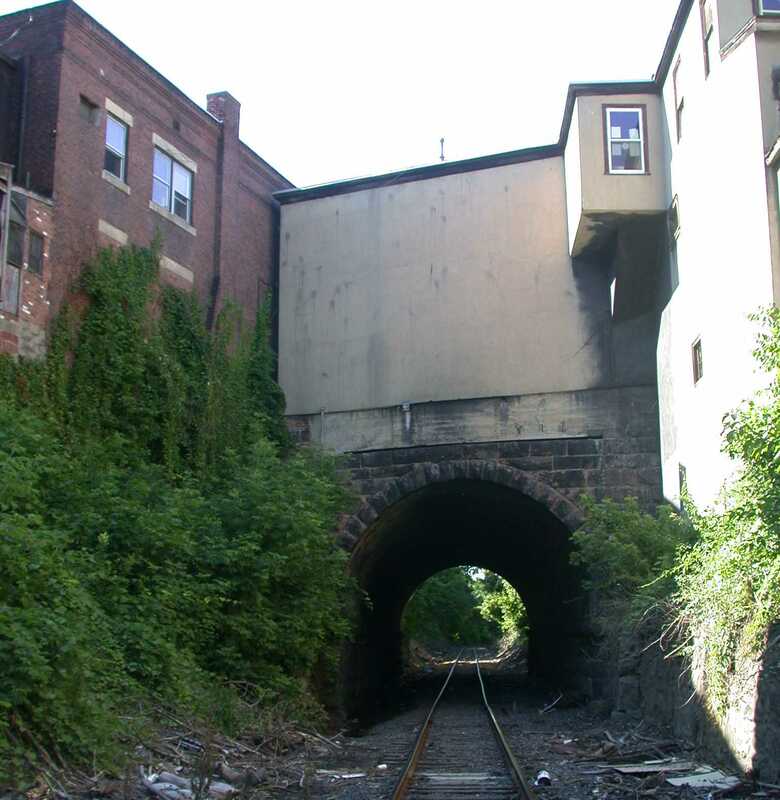 After the Connecticut River line was taken over by the New England Central in 1989, further excavation has lowered the bottom of the tunnel enough to accomondate double-stacks. This produced a toy-train-like elevation profile in the southern approach.